Ufa, the capital of the Republic of Bashkortostan, that has not been very well known to nations outside of those included in the former USSR so far, will be included in the annals of the world history from now on. July 8-10, it hosted events that will be considered as landmarks in the contemporary world history. Within these days, it hosted forums of the three associations: regular summits of BRICS and SCO countries chaired by Russia, and a meeting of the heads of the EAEU. The fact that Member States found themselves in the same time zone and territory has not diminished the importance of each of them, but confirmed their importance in the world politics, thus unveiling and revealing mutual interests, relations and deep-rooted connections. These associations appear to be resting in the shelter of one common dome, and being together they represent a powerful dynamic mix with enormous human (half of the world’s population), natural, energy, cultural, even cosmic and spiritual potential, that has shifted the balance of global power, the main vectors of development. This is not a mechanical turn towards the East, as the media tends to describe it. In fact, it is natural mutual attraction, the consolidation of countries representing different ancient, centuries-old, unique civilizations. This was an unprecedented demonstration of the intent of governments from three continents to stand firm and act in order to achieve their guiding objectives: security, the right to choose their own path of development, equal relations, mutually beneficial cooperation. A new direction took shape in the progressing course of history in Ufa, and its slogan is humanism. Ufa has become not only a place for conceptual discussions, but also a base for launching practical activities aimed at ensuring security, stability, overcoming the obstacles provoked by the global economic crisis, and creating conditions for developing the economy, decent living standards for the population masses, solving the problem of employment and improving education. Just a simple list of the documents signed, projects agreed and approved, financial, banking, economic, transport oriented, cultural, and other structures would require dozens of pages. The most important is that their functioning mechanism has been virtually launched. It is vital that attention is focused on the problems of the young generation, since it makes up to half of the population of growing states. And the most pressing question of our time is the fight against man-made evil, which has become the most widespread calamity: terrorism, extremism, creeping radicalism, violence, maligning of Islamic religion and its use for malicious political purposes. 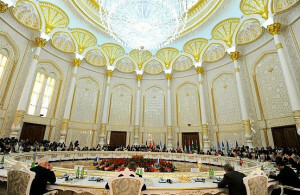 It is logical that priority documents approved at the meeting of heads of the SCO Member States include a program of cooperation in combating terrorism, separatism and extremism for 2016-2018. History was making in Ufa. It is symbolic that in Ufa, in the heart of Eurasia, the world order started to reshape, and a new system and a new structure of relations between the countries based not on submission or dependence, but mutual interaction, were developed. This is not just a milestone, but a turning point in history: a transition to the new system of international relations. Humanity passed the point of no return in Ufa: from the unipolar Western, or rather Anglo-Saxon world, to a polycentric world, in which interests of all the nations and continents should be represented and taken into account on an equal basis. This concept is reflected in its entirety in the basic documents of BRICS. They are the Declaration of Ufa, the Action Plan with ambitious targets of BRICS operation for the next year and for the future, the Strategy of BRICS economic partnership. It also presupposes establishment of its own new structure of financial organizations. The meeting in expanded format announced the completion of the process of creating a New Development Bank and Contingent Reserve Arrangement with a total resource volume of 200 billion dollars. In the nearest future, they will start operation at full capacity, while the New bank will be engaged in large-scale joint projects with transport and energy infrastructure in the field of industrial development. The summit of the Shanghai Cooperation Organization signed the Ufa Declaration of the heads of the SCO Member States, which sets approaches of participating countries in the further development of the association, key international and regional issues, as well as the SCO development strategy till 2025. Let us say it again: the balance of power has shifted, and further movement will be determined by the association, a kind of orchestra of forces representing the majority of the global population. And they are the nations on the rise of their demographic and economic spheres, on the upgrade of their biological and spiritual development. The poverty level in many of these countries is surely high, but it is necessary and possible to turn this into a stimulus for awakening and emancipation of the huge potential power of their younger population. They are different, but they share common moral values, mentality and attitude, being a powerful energy. In the West, the western civilization’s keyword is profit and the protection of individual integrity. In the new world, justice will be the dominating force. This is collective mentality of the community, where free development of each person creates conditions for free development of the remaining members. Here, value is defined not by personal fortune and wealth, but by honour and moral behaviour. The religious, for example, believe that wealth is bestowed by the Almighty for equal distribution, and everyone is obliged to share it with others. Reaching this in real life is difficult, but it must be the goal, which everyone should strive for. That is the way to a just society where everyone can exercise the right to a decent life. At the heart of this historical turn of events lie two independent organizations, ranging over three continents, BRICS and SCO, that are neither groups, nor alliances, but structures for cooperation and development. They are not challenging the United Nations and do not intend to become an alternative or counterweight to other international organizations. This is not an elite private club; on the contrary, the SCO is already turning from the “six” to the “eight”, increasing its weight owing to the accession of India and Pakistan – not only powerful and nuclear-armed states, but carriers of ancient civilizations. In addition, Iran is planning to join it in the nearest future. Other countries seek to be included in the orbit of the SCO as an observer, for example, as Belarus made it in Ufa. Armenia, Azerbaijan, the Kingdom of Cambodia and Nepal are joining the SCO family in the status of a dialogue partners. A similar interest has been shown by a number of other countries. The main thing is that in Ufa, at the stage of declaration, preparing documents, developing specific structures, a specific, previously developed practical structure of the new world order was launched into action. Some of these structures will be imperfect, they will change, but the main thing is that the major functions of the mechanisms in the newly sparked order begin to work. Ufa was the crossroads of the world’s heavyweight giants. These are all young countries rapidly growing in size and development of core competencies of the modern era and its technologies. And their grandiose projects match together; they are set in details in the SCO Development Strategy till 2025, in the documents coupling the giant economic belt of the Silk Road and the EAEU. Russia and China became the driving force of the new era development; they underwent hardships, they climbed out of crisis and never allowed to be humiliated. In many respects, this is a merit of their leaders – President Putin and PRC President Xi Jinping. At the very beginning, we noted that Bashkortostan had not been well known in the international community. This is not quite the case. It all depends on your point of view. After all, even in the VIII century, the great Rashid-al-Din Hamadani in his famous work “Oguz-name” wrote about Bashkiria as widely known and clearly mentioned in Arab-Persian manuscripts. The Arab geographers Ahmad ibn Fadlan and al-Balkhi, an Italian monk Plano Carpino reported about the country of Bashkirs, its people and customs in the IX-XIII centuries. A Persian scholar, lexicographer, Ibn Rust wrote that the Bashkirs, who live in the territory on both sides of the Ural mountain range between the Volga, Kama, Tobol and upstream of Yaik, were proud, independent people. And there is no doubt that after recent events certainly carrying historical importance, summits in Ufa, Bashkiria and its glorious hospitable people will become known on all the continents.